This is gorgeous, I really love the stitching... it looks terrific. 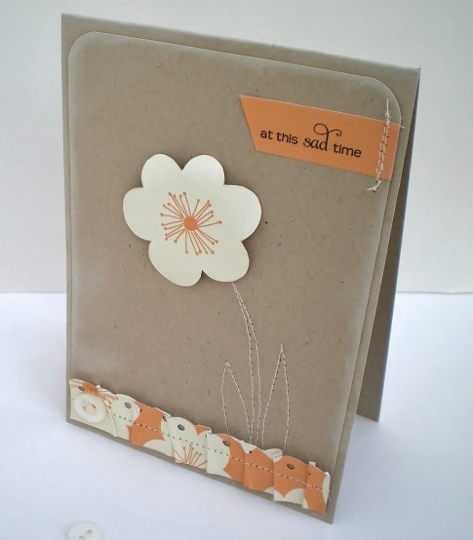 The result of you playing with the stitching of the stem and leaves has really paid off - this card is super. Just to think those scraps could of gone in the bin! Lovely subtle colours and I really like the ruffle along the bottom as well as the stitched leaves. Great card. Pretty flower with the stitched stem and leaf! I like the stitched border too. Great card! Vicky love this sentimental card. Being new to the scrapbooking world I'd love to know how you stitched this card! It is amazing! Beautiful card Vicky. I love the stitching! Just fab! Always so hard to make a sympathy card, but this is just so simple and beautiful. Love the colours youve used, makes such a change! This is so pretty Vicky.